Israeli forces have continued their systematic crimes in the occupied Palestinian territory (oPt) for the week of 27 April – 03 May 2017. 37 Palestinian civilians were wounded during peaceful protests in the West Bank. Among the wounded were 14 children. 14 journalists, including 3 females, were beaten while covering a protest in occupied Jerusalem. Fire was set to 10 stores and 2 restaurants in Beita central market, due to which they were completely burned. During the reporting period, Israeli forces wounded 37 Palestinian civilians, including 14 children, in the West Bank. In the Gaza Strip, Israeli forces continued to pursuit the Palestinian fishermen in the sea and open fire at Palestinian farmers at the border areas. Protests in solidarity with the prisoners: 22 civilians were wounded, including 9 children. Fourteen of them were wounded by live ammunition, 7 others were wounded by metal bullets and one was hit by a gas canister to the head. Weekly protests against the annexation wall and settlement activities: 8 civilians, including 2 children, were wounded. Two of them were wounded by live ammunition and 6 others were wounded by metal bullets. Incursions: 7 civilians, including 3 children, were wounded. Four of them were wounded by live ammunition and the 3 others were wounded by metal bullets. Among the wounded was a child, who was wounded in al-Eisawiya village, northeast of occupied Jerusalem. In the same context, tear gas canisters and sound bombs heavily fired at the protest organized at Beit village intersection, south of Nablus, resulted in setting fire to the central market. As a result, 10 stores and 2 restaurants were burnt. In the Gaza Strip, concerning Israeli attacks on fishermen in the Gaza Strip sea, on 30 April 2017, Israeli navy forces opened fire at the Palestinian fishing boats sailing off Beit Lahia shore, north of the Gaza Strip. They surrounded a fishing boat sailing within 2.5 nautical miles, arrested 2 brothers on board of the boat and confiscated the boat and fishing nets. Other attacks recurred in the morning and afternoon on Monday, 01 May 2017 and on Tuesday morning, 02 May 2017. On 30 April 2017, Israeli gunboats opened fire at fishing boats sailing within 6 nautical miles off Deir al-Balah shore in the central Gaza Strip. Similar attacks recurred in the same area on 01 and 03 May 2017. In the context of targeting the border areas, on 27 April 2017, Israeli forces shelled a Palestinian border guard site, east of al-Salqa valley, east of Deir al-Balah in the central Gaza Strip. No casualties were reported. On 30 April 2017, Israeli forces stationed in the east of Khan Yunis, south of the Gaza Strip, opened fire at agricultural lands in the east of al-Fokhari village. No casualties were reported. On 02 May 2017, Israeli soldiers stationed in a watchtower, east of Gaza valley, northeast of al-Bureij refugee camp, opened fire at farmers and shepherds in the border area. no casualties were reported as well. During the reporting period, Israeli forces conducted at least 60 military incursions into Palestinian communities in the West Bank and 7 ones in Jerusalem. 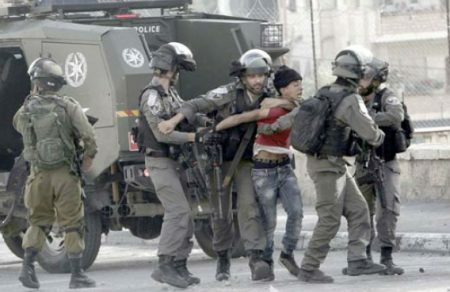 During these incursions, Israeli forces arrested at least 85 Palestinian civilians, including 27 children and a girl. Thirty-three of them, including 15 children, were arrested in occupied Jerusalem, while 12 others, including 6 children and the girl were arrested while participating in a protest supporting the Palestinian prisoners. On 28 April 2017, Israeli forces surrounded Hebron Governmental Hospital and fired gas canisters at the entrance to the emergency section. As a result, the glass was smashed. Israeli undercover units stormed then the vicinity of the hospital and arrested a Palestinian civilian. In the Gaza Strip, on 30 April 2017, Israeli forces conducted an incursion into the east of al-Qarara village, while conducted another one in the east of al-Fokhari village on 03 May. In both incursions, Israeli forces levelled lands along the border fence for few hours and withdrew later. On 27 April 2017, a group of settlers from “Brakha” settlement moved into the outskirts of Burin village, south of Nablus, under the guardianship of the Israeli forces. They set fire to the mountain, due to which, dozens of olive trees were burnt before the Palestinian civilians and civil defence could extinguish the fire. On 29 April 2017, under the guardianship of the Israeli forces, a group of settlers from “Yetshar” settlement attacked a house belonging to the family of Monir Suleiman, northeast of Ourif village, south of Nablus. As a result of the attack, the windows were smashed. Following the Friday prayer, dozens of Palestinian civilians and Israeli and international human rights defenders organized demonstrations in Bil’in and Nil’in villages, west of Ramallah, protesting against the annexation wall and settlement activities. Israeli forces forcibly dispersed the protests, firing live and metal bullets, tear gas canisters and sound bombs. They also chased the protesters into olive fields and between houses. As a result, many of the protesters suffered tear gas inhalation while others sustained bruises as Israeli soldiers beat them up. At approximately 13:00 on Thursday, 27 April 2017, dozens of Palestinian young men gathered after ending an activity organized by the residents of Beit Ummer village, north of Hebron, in solidarity with the Palestinian prisoners on hunger strike. They made their way towards the village entrance at which the Israeli authorities established a military watchtower. The young men threw stones at the soldiers, who fired sound bombs and tear gas canisters in response. Backup forces arrived at the area and closed the village entrance with an iron gate. Other soldiers topped roofs of houses belonging to Abdul ‘Aziz Mahmoud Abu ‘Ayash, Mohammed Hammad Abu Mariyah, and Mohammed Ahmed ‘Awad. The soldiers fired tear gas canisters and live bullets at the stone-throwers. The clashes continued until the evening, resulting in a number of civilians suffering tear gas inhalation. At approximately 18:00 on the same Thursday, “‎Lajee” Center organized a protest at the northern entrance to Bethlehem. A large number of prisoners’ families and relatives along with activists of the Popular Resistance Committee. They made their way to ‘Aydah refugee camp towards the northern entrance to the city. When the protestors arrived at the military checkpoint, north of Bethlehem, the soldiers fired tear gas canisters at them and chased them. They then arrested Abdullah Naser al-‘Afifi (15) and Tamer ‘Awad (14). At approximately 20:00 on the same Thursday, dozens of young men from Shu’fat refugee camp, north of occupied Jerusalem, organized a demonstration in solidarity with prisoners on hunger strike in the Israeli jails. The protestors marched the camp streets until they arrived at the military checkpoint. The young men threw stones and Molotov Cocktails at the soldiers stationed at the checkpoint. The soldiers then fired metal bullets and tear gas canisters at them and chased them. They arrested ‘Abbas ‘Azzam (21) after they severely beat him up. Tareq Mohammed Kheizaran: 2 barracks (110 square meters each) contained items used in canning fruits and vegetables. Wesam Ghassan Saleh Hamayel and his partner Anwar Helal Bani Shamsah: a 100-square-meter barrack containing machines. Abdullah Shaker Duwaikat: an 18-square-meter restaurant, which contained a fridge, cooking gas and 3 cooking gas pipes. Abdul Naser Khalil Abdul Fattah ‘Attallah: a 60-square-meter restaurant built of tin plates and bricks. Khaled Ibrahim Khalil Abu Msalam: a 1000-square-meter barrack, which contained items. Elbana Company for Import & Export belonging to Eyad Mohammed Khalil Bana: 2 barracks of 800 square meters each. They contained 22 tons of garlic, 500 boxes of organges, 3000 small boxes, 353 cartons of date and 1000 wooden large cartoons. A company belonging to Zeyad Abdullah ‘Atallah: 2 barracks built of tin plates. The first was built on an area of 300 square meters and the other on 200 square meters. They contained plastic and wooden boxes. ‘Allam Hamdi Bazian a 300-square-meter barrack that contained plastic and wooden boxes. Ayman Rezqallah Mohammed Aqtash: a 360-square-meter barrack that contained wooden boxes and Nylon used for packaging. On the same Friday, dozens of Palestinian civilians organized a peaceful protest in solidarity with Palestinian prisoners, who went on a hunger strike, near the entrance of “Ofer” military camp established in Betounia and Rafat villages, west of Ramallah. When the protestors arrived at the area, the Israeli soldiers fired live bullets, tear gas canisters, sound bombs and rubber-coated metal bullets. As a result, a 22-year-old civilian sustained a live bullet wound to the right leg. The Israeli forces also attacked Mohammed Ayman Abu ‘Atiyah (17), from al-Am’ari refugee camp, and Ahmed ‘Adnan al-Khdour (19), from Betounia village, west of the city, and then arrested them. Note: during the same Friday, Israeli forces used force to disperse the demonstrations organized in solidarity with prisoners on hunger strike. The demonstrations were organized in the following areas: Howarah checkpoint, south of Nablus; ‘Ourta checkpoint, southeast of the city; Beit Furik checkpoint, east of the city; al-Naqourah village near “Shafi Shamron” settlement, northwest of the city. The Israeli forces fired tear gas canisters and sound bombs at the civilians at the end of the Friday prayer. As a result, dozens of the civilians suffered tear gas inhalation and received medical treatment on the spot by paramedics who were in the area. At the end of Friday prayers, hundreds of Palestinian civilians participated in a demonstration organized by national factions in Hebron in solidarity with Palestinian prisoners on hunger strike. They made their way from al-Husain Mosque in Hebron towards Ebn Rashed intersection, where a permanent sit-in tent is established. After half an hour, dozens of young men made their way to al-Zawiyah Gate in the city. However, an Israeli infantry unit arrived at the entrance to al-Shuhada’ Street. They then fired tear gas canisters at the civilians, who then threw stones and empty bottles and set fire to tires in Abu al-Hums road in order to prevent the Israeli jeeps and wastewater pumping vehicle, which sank the area with skunk water, from moving. The soldiers then chased the young men near Hebron Governmental Hospital and then randomly fired live bullets at them. As a result, a 14-year-old child sustained a live bullet wound to the left knee and then was transferred to the abovementioned hospital. The soldiers continued moving towards the road that leads to the entrance to the emergency department in Hebron Governmental Hospital as one of them fired tear gas canister at the entrance. As a result, the glass crashed. The Israeli soldiers stationed in the area until the afternoon when Israeli undercover officers dressed like Palestinian civilians raided the vicinity of the hospital and arrested Fares Sa’di al-Haimuni (21), taking him to an unknown destination. Around the same time, dozens of Palestinian civilians organized a peaceful demonstration and made their way from the set-in tent established in solidarity with prisoners on hunger strike to military watchtower established at the eastern entrance to Beit Ummer village, north of Hebron. When the demonstrators arrived at Khelet al-‘Ein area, an infantry unit, which deployed in the road, closed the abovementioned entrance. The soldiers fired live bullets, rubber-coated metal bullets and tear gas canister at the demonstrators, who spread between houses while the wastewater pumping vehicle pumped wastewater at the vehicles and shops. After that, a number of soldiers topped the roofs of houses and fired live bullets at the civilians. As a result, a 24-year-old civilian sustained a live bullet wound to the left leg, a 20-year-old civilian sustained a live bullet wound to the back of the right thigh, and a 45-year-old civilian was hit with a metal bullet to the right leg. The wounded civilians were transferred to the Governmental Hospital in the city via civilian vehicles. The soldiers, who were on the roofs, stayed there until at approximately 18:00. Some of the houses’ owners were identified as Faleh ‘Arar, Reyad ‘Arar and Mohammed Kamel Abu Maria. At approximately 17:30 on Saturday, 29 April 2017, dozens of Palestinian civilians gathered in al-‘Amoud Gate yard, Nablus and Salah Eden Streets at the entrances to East Jerusalem’s Old City in order to organize a protest in solidarity with Palestinian prisoners on hunger strike in the Israeli jails. The protest paved its way from al-‘Amoud Gate square as the civilians were raising prisoners’ photos and slogans supporting their demands. The soldiers then confiscated the photos and slogans and patrolled in front of the entrance to al-‘Amoud Gate and its yard. They also prevented Palestinians from entering through the abovementioned gate. Israeli mounted police officers then chased the civilians from Nablus Street into the bus station. Some of the protestors challenge the Israeli officers and chanted slogans and raised some photos of the prisoners. However, the officers attacked and beat them and then beat the media workers, who were in the area covering the protest, with their riffles’ butts. As a result, a number of them sustained bruises. Photographer ‘Ammar ‘Awa sustained bruises to the hand after being beaten with riffles’ butts. He said to PCHR’s field worker that he and a group of journalists, including Ahmed Gharablah, were in the area when the Israeli forces suddenly started beating them and forced them to leave the area. Photographer Ahmed Gharablah fell on the ground and his camera lens crushed when the mounted police officers was chasing him. The Israeli forces also pushed Nawal Hejazi, a reporter at Al-Kofiya TV Channel, causing her various bruises. Journalist Diyala Juwaihan said to PCHR fieldworker that the Israeli forces beat her with their hands, so she sustained bruises to the back and neck. She also knew that journalist Misaa’ Abu Ghazalah, photojournalists Mahmoud ‘Eliyan, Senan Abu Mizer, Fayez Abu Ermilah, ‘Ali Yasin, Mustafa al-Kharouf, Roze al-Zour, Rami al-Khatib, Raja’e al-Khatib and Eyad al-Taweel sustained bruises due to the Israeli attacks. Their wounds were classified as minor. Moreover, the Israeli forces arrested Yasin Sbaih (31), Loay Faraj Jaber (19), Suheib Ahmed Syiam (16) and ‘Amr Sa’ed al-Qawasmi (15). The journalists’ cameras recorded the arrest and beating of 3 of them. At approximately 14:00 on Monday, 01 May 2017, Israeli forces suppressed an activity organized by a number of young men in al’Amoud Gate yard at the entrances to East Jerusalem’s Old City in solidarity with Palestinian prisoners on hunger strike. The participants drew paintings showing solidarity with the prisoners and wrote slogans to support prisoners’ fair demands. However, the soldiers prevented participants from continuing the activity, confiscated the paintings and dispersed them. Meanwhile, the Israeli forces arrested Somoud Naser Abu Khdair (21) and took her with them. On Thursday 27 April 2017, Israeli forces established 2 checkpoints at the entrance to Bani Na’iem village and at the eastern entrance to Dura village. On Friday, 28 April 2017, Israeli forces established 3 checkpoints at the northern entrance to Hebron, and at the entrances to Beit Kahel and al-‘Aqaba villages. On Saturday, 29 April 2017, 2 similar checkpoints were established at the entrances to al-Fawar refugee camp and Sa’ir village. On Sunday, 30 April 2017, Israeli forces established 4 checkpoints at the entrances to Beit ‘Awaa village and al-‘Aroub refugee camp, Khelit al-Maiyah, east of Yatta village, and on Yatta -Samou’a road. On Tuesday, 02 May 2017, 3 similar checkpoints were established at the entrances to al-Fawar refugee camp and Karza and Samou’a villages. Ramallah and al-Bireh: Israeli forces established (5) checkpoints all over the city. On Sunday, 30 April 2017, Israeli forces established 3 checkpoints at the entrance to Ras Karkar village, west of Ramallah; ‘Ain Sina village’s intersection, north of the city; and at the eastern entrance to Silwad village, northeast of the city. On Monday, 01 May 2017, Israeli forces established 2 checkpoints at ‘Atara bridge, north of Ramallah and at the entrance to Dier Nizam village, northwest of the city. Jericho: Israeli forces established (5) checkpoints all over the city. On Sunday, 30 April 2017, Israeli forces established 4 checkpoints at the northern entrance to Jericho; at al-‘Oja village’s intersection; at the entrance to Marj Na’jah village, north of the city; and at the Dead Sea’s intersection, south of the city. At approximately 20:30 on Monday, 01 May 2017, Israeli forces established a checkpoint at the southern entrance to Jericho. At approximately 10:45 on Saturday, 29 April 2017, Israeli forces established a checkpoint at the eastern entrance of Qalqiliya. They checkpoint was established again at approximately 18:10 and 20:35. At approximately 20:35 on Sunday, 30 April, Israeli forces established a checkpoint between ‘Azzun village and’ Ezzbet al-Tabib village. At approximately 21:00, Israeli forces established a similar checkpoint at the entrance to ‘Azzun village, east of Qalqiliya. On Monday 01 May 2017, Israeli forces established 2 checkpoints at the eastern entrance of Qalqilya and at the entrance to Azzun village, east of the city. At approximately 21:15 on Sunday, 30 April 2017, Israeli forces established a checkpoint at the entrance to Kafel Haris village, north of Salfit. At approximately 21:20, Israeli forces established a similar checkpoint at the entrance to Qarawat Bani Hassan village , northwest of the city. At approximately 15:30 on Thursday, 27 April 2017, Israeli forces moved into al-‘Issawiyia village, northeast of occupied Jerusalem. They deployed in the village, topped the buildings’ roofs and then stationed there. They also raided a sit-in tent, which was established by the village’s residents in solidarity with the prisoners on hunger strike in the Israeli jails, and then confiscated its contents. Meanwhile, Palestinian young men gathered and threw stones at the Israeli soldiers, who fired live bullets and rubber-coated metal bullets in response. At approximately 19:00, an Israeli sniper fired a live bullet at Mos’ab Mahmoud Muhaisen (14). As a result, Mos’ab was hit to his lower limbs and was then taken to “Sh’aare Zedek” Hospital. In the meantime, the Israeli forces stopped the ambulance carrying Mos’ab and arrested him. Bashar Muhaisen, Mos’ab’s uncle, who accompanied him since his injury, said that Mus’ab was wounded several meters away from his house while he and his family were on a family event. Mos’ab was immediately taken by ambulance to al-Makassed Hospital in Tour area and was then taken to “Sh’aare Zedek” Hospital. Muhassin also stated that while Mus’ab was discharged from al- Makassed Hospital by ambulance, a private car chased the ambulance. After that, at al-Sawanah neighborhoods’ intersection near “Beit Urut” settlement, the ambulance was surrounded by the Israeli Intelligence officers and soldiers. They then stopped the ambulance and arrested its crew. The soldiers obliged the crew to head towards a yard near al-Motala’ Hospital. Mohassin added that the Israeli forces detained Mos’ab along with the paramedic’s in the ambulance for an hour. Mohassin also clarified that Mos’ab was bleeding and then arrived at the hospital, where medical sources classified his heath condition as serious. He added that Mos’ab’s family stayed with him at the hospital until midnight, but the hospital guards forced them to leave. In addition, Mohassin stated that Mos’ab remained in the hospital until Friday morning to receive treatment. Despite his need for observation, Mos’ab was taken to the al-Maskoubiya Center, where he was brought before the court judge. It should be noted that after Mos’ab’s detention was extended, he was taken to the Salah al-Din police station for interrogation. At approximately 03:00 on Thursday, 27 April 2017, Israeli forces moved into Abu Dees village, east of occupied Jerusalem. They raided and searched a house belonging to Ibrahim Nabil Bader (30) and arrested him. At approximately 00:00 on Sunday, 30 April 2017, Israeli forces moved into al-‘Issawiyia village, east of occupied Jerusalem. They raided and searched dozens of houses and arrested 15 civilians, including 7 children. PCHR keeps the names of the arrested persons. At approximately 13:00 on Monday, 01 May 2017, Israeli forces moved into al-Tour neighbourhood, east of occupied East Jerusalem. They raided and searched houses from which they arrested Mohamed Mahmoud Abu al-Hawa (14) and Ahmed Fareed Abu Ghannam (16). At approximately 16:00 on Tuesday, 02 May 2017, Israeli forces moved into Surbaher village, south of occupied East Jerusalem. They raided and searched houses belonging to Abu Hamed family from which they arrested Mohamed (43) and Mazen Mifleh Abu Hamed (38). It should be noted that the Israeli forces hit Mohamed and Mazen and pepper-sprayed them before arresting them. At approximately 01:00 on Wednesday, 03 May 2017, Israeli forces moved into Silwan village, south of occupied East Jerusalem. They raided and searched houses from which they arrested 6 civilians, including a child. The arrested persons were identified as Islam Ahmed al-A’war (23), Majd Kamal al-A’war (17), Moahemd Mousa ‘Odah (23), Ziyad Ahmed al-Qaq (24), Foad Ahmed al-Qaq (21) and Mohamed Ali Abu Tayieh (22). At approximately 02:00 on Wednesday, Israeli forces moved into al-Tour neighbourhood, east of occupied Jerusalem. They raided and searched houses from which they arrested 5 civilians, including 4 children. The arrested persons were identified as Salman Naser Abu al-Hawa (16), Ali Mohamed Abu Jum’a (17), Naseem Yousef Khawis (15), Omar Barakat Khawis (19), and Mahmoud Wael Abu Laban (16). At approximately 10:00 on Thursday, 27 April 2017, a group of Israeli settlers from “Bracha“and “Arousa” settlements moved into the outskirts of Bureen village, south of Nablus, under the Israeli forces protection. A number of Palestinian young men gathered to confront the Israeli settlers, who set fire in the northern mount near al-Manateer neighborhood. As a result, dozens of olive trees were burned before the village’s residents and civil defense crews could extinguish the flames that continued until the evening. At approximately 13:30 on Saturday, 29 April 2017, around 15 Israeli settlers, one of them had an M16, were accompanied by 3 Israeli soldiers moved into ‘Oreef village, south of Nablus. They attacked a house belonging to Muneer Hasan Suliman. They threw stones towards the house and damaged its windows. During which, a number of Palestinian civilians gathered and confronted the Israeli settlers. After that, the Israeli forces fired tear gas canisters and rubber-coated metal bullets at them. As a result, Tayseer Faieq Safadi (55) was hit with a rubber-coated metal bullet to his left leg. Fully detailed document available from PCHR’s official website.